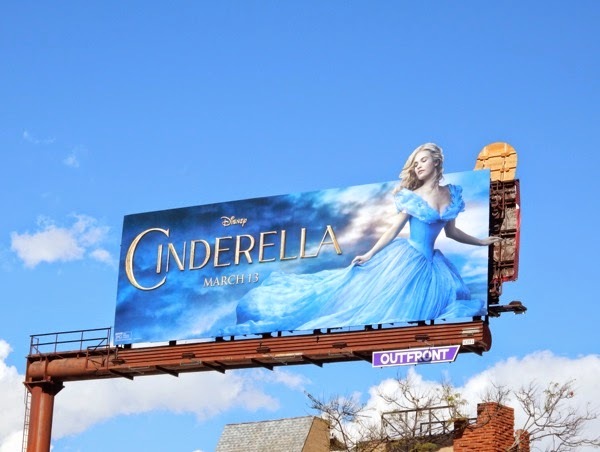 You can't help but be charmed by Disney's new live-action Cinderella movie, it's unapologetically fairytale fantasy in all its Disney Princess glory. There's no major dark twists or reinventions, like Disney's recent adaptation of Stephen Sondheim's musical Into the Woods or with Angelina Jolie in Maleficent, this is pure sweeping romance, glass slippers and all, from director and renowned thespian Kenneth Branagh. 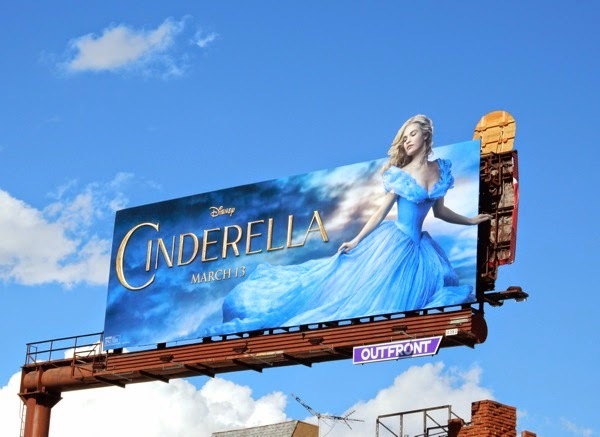 Downton Abbey's Lily James play the young, beautiful 'Ella' in this rags-to-riches story largely based on Walt Disney's 1950 beloved animated classic, with Cate Blanchett playing her wicked Stepmother and Sophie McShera and Holliday Grainger cast as her cruel Stepsisters. 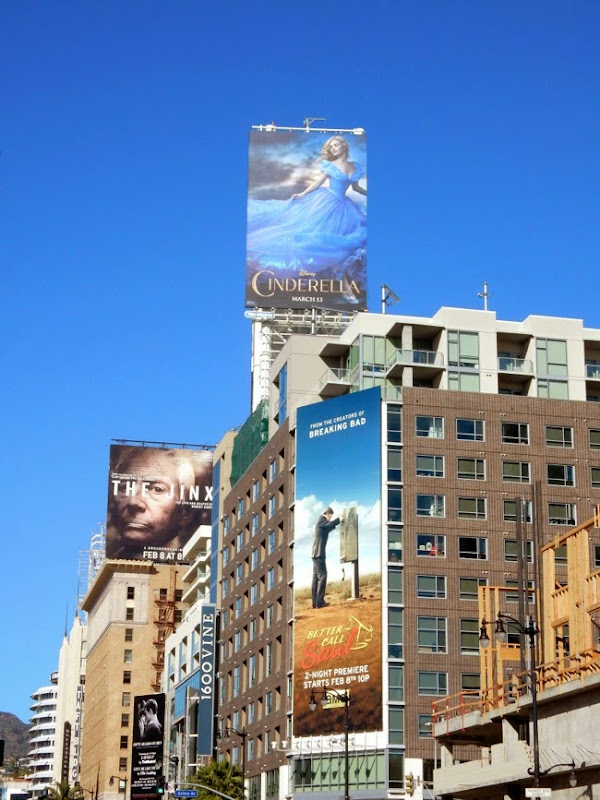 Helena Bonham Carter brings her eccentric talents as Cinderella's Fairy Godmother and Game of Thrones Richard Madden is the Prince Charming who captures her heart. 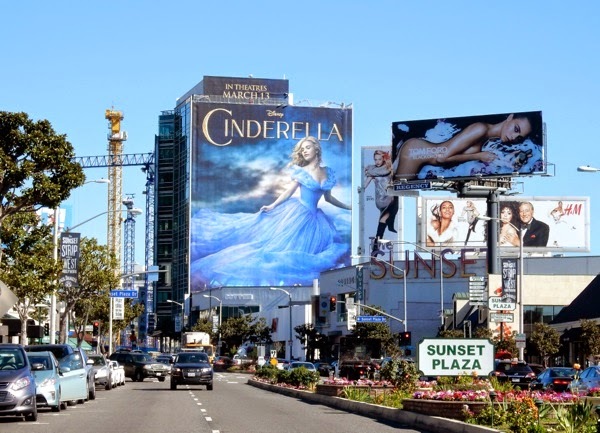 This giant-sized magical billboard for Cinderella was snapped brightening up L.A.'s Sunset Plaza on January 23, 2015. 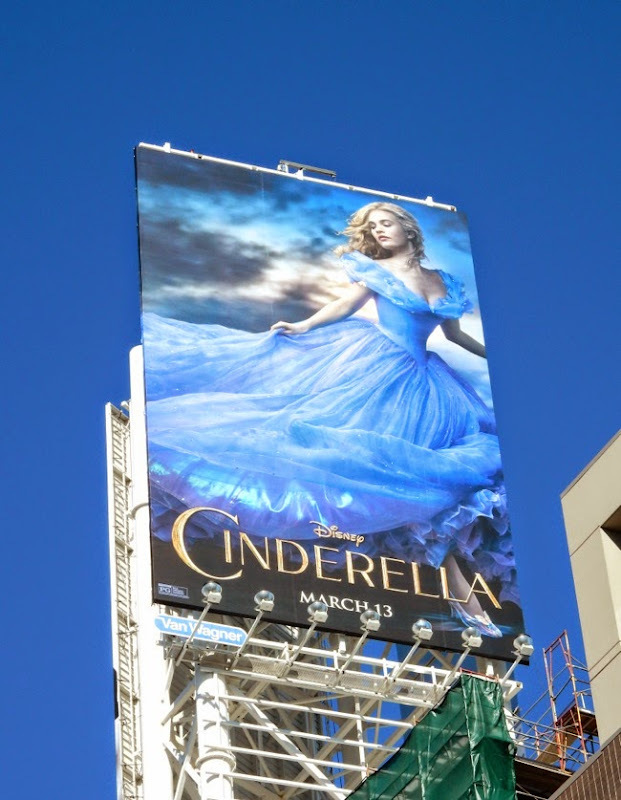 Prepare for a dazzling happily-ever-after spectacle if Cinderella's gorgeous, voluminous ball gown is anything to go by. 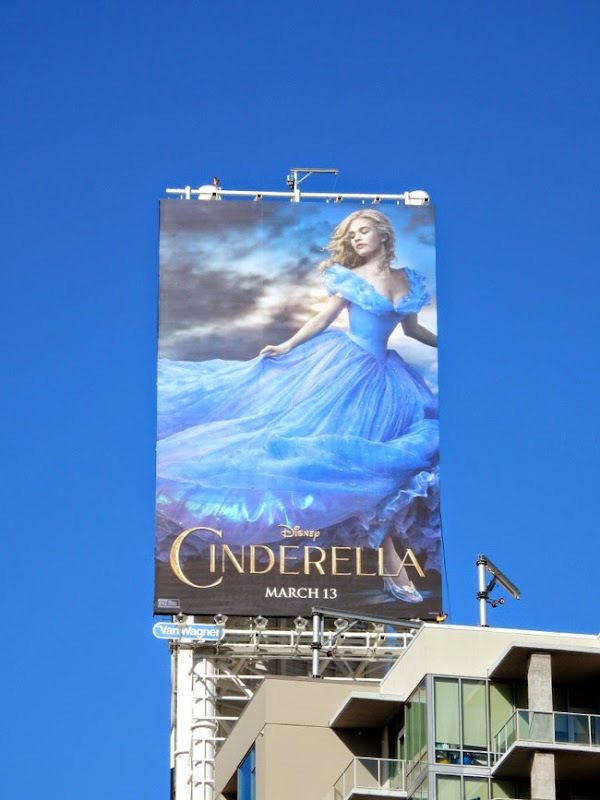 UPDATED: Here's another smaller billboard for the live-action Cinderella, spied high over Vine Street in Hollywood on February 9, 2015. 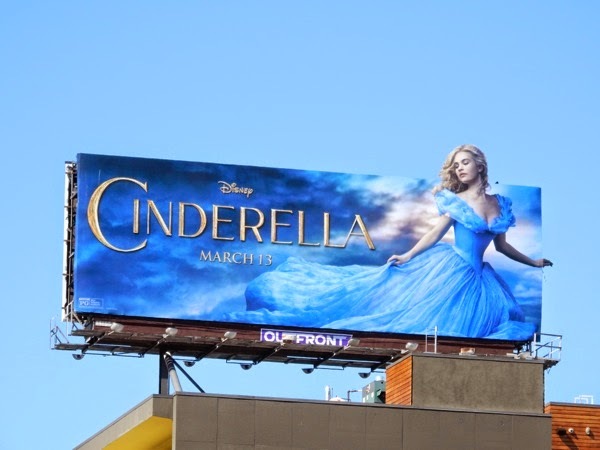 Keen observers will see that this dreamy version features one of those infamous glass slippers from the fairytale. 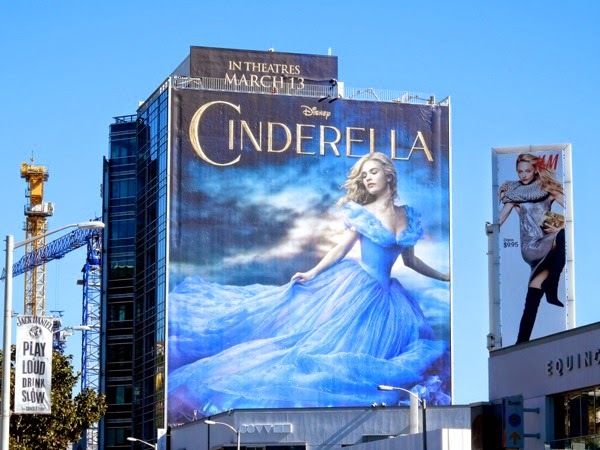 UPDATED: This Cinderella key art is really a great example of how one dreamy visual can be used across multiple sizes and formats and have consistently great impact. 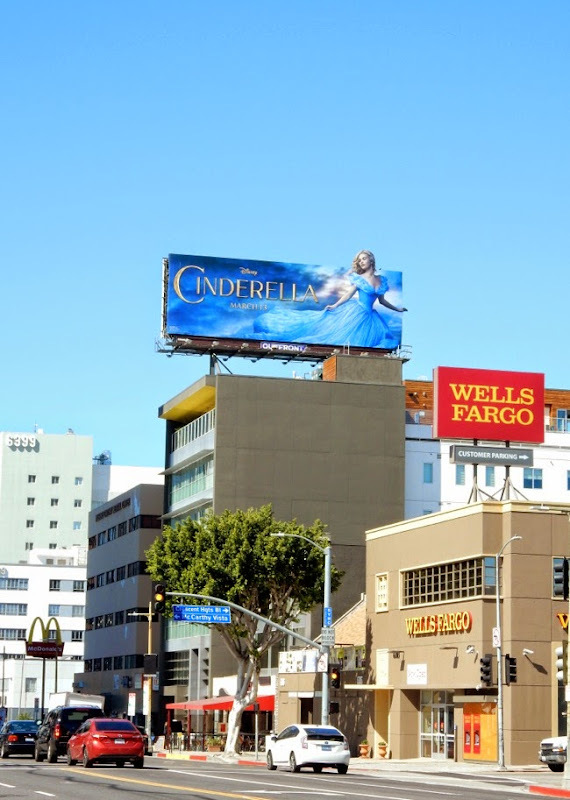 Daily Billboard especially likes this special extension billboard for the Disney movie, snapped along Santa Monica Boulevard in Westwood on February 23, 2015 (although it's a shame that it's back to back with another extension billboard, which spoils the full effect). 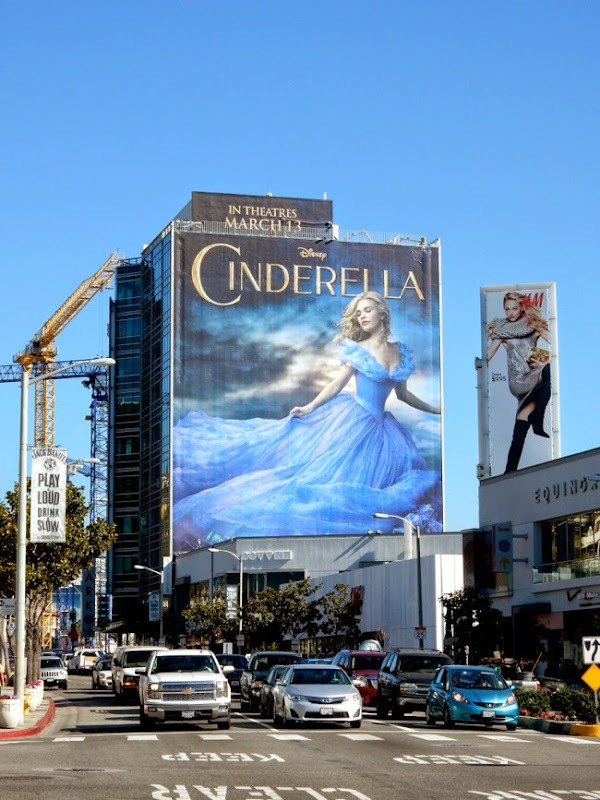 If you're a fan of the classic fairytale, be sure to also check out these original Cinderella movie costumes worn by Lily James and Richard Madden on display. 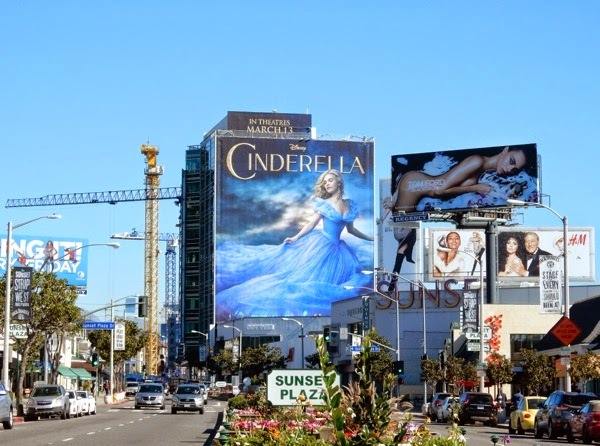 Plus here's another special extension billboard for Cinderella spotted making an impression high over Wilshire Boulevard on February 24, 2015.